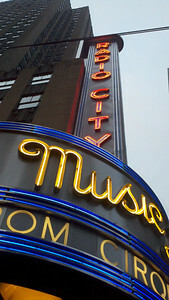 July 3, 2011 / Radio City Music Hall, New York, NY -- Joe had mentioned that he wanted to see this show which is pretty heavily promoted around town. So when I got a deal for 50% off in Living Social (www.livingsocial.com), I jumped on it. We went not knowing exactly what to expect. Boy were we surprised. It was such a great show. The first hint of the zanyness was when these clowns started appearing in the audience while the theatre was filling up, before the show began. They were meandering around doing mime-type antics with random people. Very cute. The show itself was a two-hour spectacle of theatrics, music, gymnastics, acrobatics, dance and comedy. The choreography was perfect. The imagination of the creators was so wonderful. There was an underlying story which was basically a love story. We would recommend this show to anyone and would love to see it a second time ourselves.